Google yesterday implemented a bookmark sync function in the latest developer build of Chrome. The new feature will let you sync your browser bookmarks across all your computers running the latest dev version of Google Chrome. The browser accomplishes this by storing the bookmarks in your Google Docs account, and then uses those files to sync your bookmarks across your various devices. To get the new functionality, go to Google Chrome's dev channel and download the browser. Once Chrome is downloaded, you just have to add " --enable-sync" to the command line flag and you're good to go. Sounds easy, right? Right-click Chrome's desktop icon and select "Properties." The third line down will say "Target" and should look something like this: "C:\Users\Username\AppData\Local\Google\Chrome\Application\chrome.exe"
Hit "Apply" and then "OK"
Log into your Google account and you're done. Once you're all set up, your bookmarks will be stored in a folder in Google Docs. (click on the screen cap for a closer look.) Now all you have to do is download the developer build on all the computers you use, enable bookmark sync on each computer, and you're ready for action. In my tests, Chrome synced new bookmarks with the Google Docs file almost instantly. 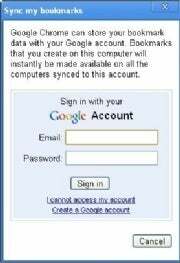 The only downside is you cannot upload bookmarks from Firefox or other browsers directly to Google Docs or make any other edits (other than delete) to the bookmarks folder. Bookmarks sync in Chrome looks like a great and simple tool, and I hope Google extends the function to mobile devices in the near future. I also tried activating bookmark sync in the Chrome build for Mac OS X, but couldn't get it to work. Anybody out there have better luck?